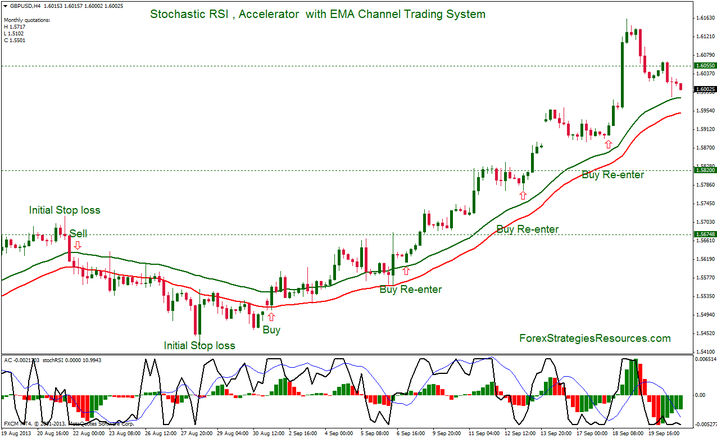 This is a Trading system that works on H4 charts and is based on indicators of Trend how two exponential moving averages (EMA) and two indicators Momentum: Stochastic RSI and Accelerator AC. Currency pair:any, but not trade with exotic currency pairs. Two exponential moving averages periods 34 High and Low that formed the EMA Channel. The EMA Channel acts as filter. Example: Buy only when the price si above the channel and sell only when the price is belowe of the EMA Channel. Acceleration / Deceleration (AC) is an indicator that was created by Bill Williams and measures the acceleration and deceleration of a driving force behind the price. According to Williams must keep in mind that the price is actually the last item to change. The price change is a reflection of the change of the force that pulls the market. Before there is a change in the direction of this force, its acceleration slows and approaches zero, after which it will again accelerate in the opposite direction until the prices have not adjusted to this movement. The indicator is represented in a histogram separated from the price chart, the calculation of this indicator is based on a difference between a short-term moving average and a moving average over the long. 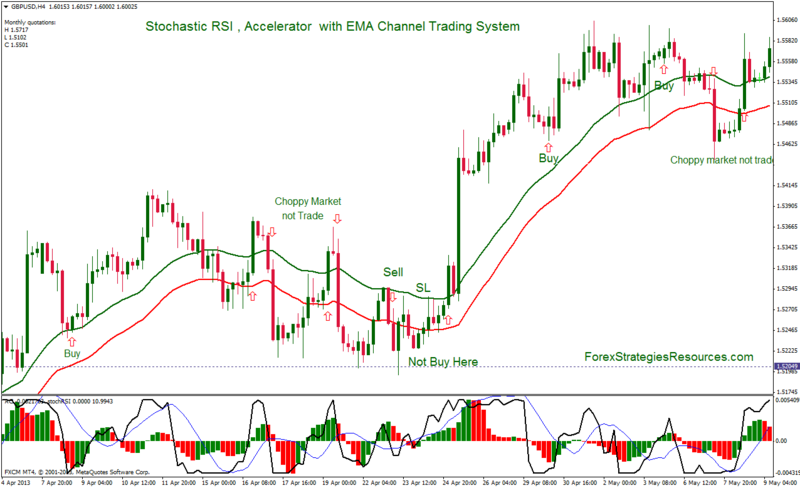 StochasticRSI indicator that was created by Tushar Chande e David Kroll is and indicator di Force-Momentum. (periods 14,14,9). Fibopivot montly: Pivot points levels based on the levels of retracemet of Fibonacci. These Fibopivot montly can also be target price. Stochastic RSI indicator is Above the Zero line. The price cross the Ema channel from below and the candle close above the EMA Channel. Enter buy at the open of the next candle. This is the Standard Entry, but I recommended to enter in the market when the trend is formed at the re-enter. Re-enter in up-trend when the Accelerator indicator has green bars and StochasticRsi indicator cross above zero from below. StochasticRSI indicator is Below the Zero line. Accelerator indicator has red bars. The price cross the Ema channel from above and the candle close belove the EMA Channel. Enter sell at the open of the next candle. This is the Standard Entry, but I recommended to enter in the market when the trend is formed at the re-enter. Re-enter in down-trend when the Accelerator indicator has red bars and StochasticRsi indicator cross below zero from above.. Initial stop loss on the previous swing but after 40 -50 pips in gain move stop loss at the entry price. Profit Target Fibopivot points or Ratio 1.5 stop loss. Stochastic RSI , Accelerator with EMA Channel Trading System. Trend Momementum Force Trading System. In the pictures below re-entry.